1) Government officials in Tacoma are trying to close down a local cigar lounge for code violations. Paul Mackay, owner of El Gaucho restaurant, has spent $15,000 on renovations to bring his lounge in compliance with Washington’s statewide smoking ban, effective since 2005. But this week the county health department ordered him to stub out the cigars because of violations: the lounge sells food and is open to the public. “Here we are trying to stay alive, and they keep dumping new rules, regulations, and taxes on us,” said Mackay. 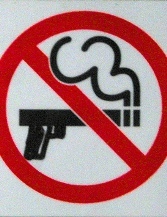 2) Other Smoking Ban Alerts: UK doctors are urging politicians to ban smoking inside all cars. California lawmakers eye a statewide ban for parks and beaches. Michigan’s private clubs are lobbying for a ban exemption. Arizona State may criminalize tobacco on its four campuses. 3) Inside the Industry: La Gloria Cubana is introducing a new cigar called Artesanos de Tabaqueros, which features a band at the bottom third of the cigar, a Connecticut wrapper below, and an Ecuadorian Sumatra wrapper above. Rocky Patel is introducing a new Decade Edición Limitada with a richer, spicier blend. Online retailer Thompson Cigars has sold off its non-tobacco retail operations, leaving the company to focus on its core cigar business. 4) Around the Blogs: Stogie Review lights up an Avo Limited Edition 2010. Cigar Inspector inspects a Fuente Work of Art Maduro. Velvet Cigar fires up the D’Crossier Golden Blend. Cigar Examiner examines a Berger & Argenti Classico. Nice Tight Ash smokes a Rocy Patel Decade Edición Limitada. 5) Deal of the Week: We’re not sure why it’s called the “Presidential Sampler,” but it’s still a good deal. You get ten cigars from big names like Montecriso, Romeo y Julieta, Graycliff, Gurkha, Camacho, CAO, Padilla, and Cohiba, for just $60 including free shipping. Grab your here.